Amidst grim reports this week that California schools are "failing to invest enough time, money and training to teach science well," and that only one out of 10 elementary school students gets to play with hands-on science experiments, a shining counter-example is happening at the Nueva School in the wealthy San Francisco suburb of Hillsborough. Sixth-grade students are using Wii remote controls to collect scientific data on things like positive and negative acceleration and thinking about conceptual issues like the difference between engineering and science. Led by Stanford researchers, the class is using Wii remote controls (available online for anywhere from $15 to $40) to create things like a rat-trap car, a marble roller-coaster, and balloon-powered vehicle to test different theories. 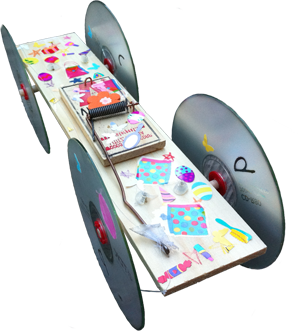 With the rat-trap car, students have created a Wii-strapped vehicle with CDs as wheels, like a skateboard. They've already experimented with smaller mousetraps and lighter batteries to see if the cars would go faster, but landed on the rat trap as the best way to measure the information they needed. The main objective of the experiment is not necessarily to measure speed, but to show students how to capture data like scientists do. Kids are typically confused by graphs, but with the Wii experiment, they could see the horizontal, vertical, and lateral aspects of the accelerometer. With the Wii remotes, students are using interesting new technology and participating in the creation of their own designs. "Kids see patterns in data," said Wendy Ju, one of the Stanford researchers working with the students at the Innovative Learning Conference held at Nueva recently. "What does that data do to contribute to their designs?" With the marble roller coaster, students used the Wii remotes to test their theories on speed. They designed the roller coaster, then used the infrared camera in front of the Wii remote to see where in the structure the marbles would role by the fastest. The same idea was used to test the speed of the balloon-powered cars. During the course of the classes, the Stanford researchers have been surprised by students' reactions: The students were more interested in the designing phase than by the measuring phase. "Students had a hard time letting go of the engineering," Ju said. "They wanted to keep redesigning things. The moments of talking about measuring stuff was interrupted by trying to find ways of redesigning and changing things." This tension between science and engineering is one of the ideas being explored through the eyes of sixth-graders. "Science labs are often really engineering projects in drag," said Stanford computer science professor Terry Winograd. "You make it work, but you don’t think about how you got there. There’s a feat, but not a deep understanding of what’s going on. You don’t get to probe the phenomenon." The Nueva kids are lucky. For most students, should they be lucky enough to have time to conduct science experiments in class, it's typically completed in 15 minutes and has a preordained outcome. "You can see where all the right answers are, and from the perspective of science, it's too neat," Winograd said. "It just tests whether you can follow instructions." That's not the best way of teaching science and scientific inquiry, he said. With the Wii remotes, students are using interesting new technology and participating in the creation of their own designs. They're actually helping researchers develop tools that can be used by other kids, and they've been incredibly vocal about what methods to use. Researchers have been operating video cameras throughout the workshops, and have hundreds of hours of footage of the kids' experiments. "You can see where kids think something else is going on and they argue about it amongst themselves, and talk about what they think should happen," Ju said. This is the third year of the WiiScience program at Nueva. How amazing would it be to see the proliferation of a class like this in all elementary schools.